Activity Assistant ensures that the activities are implemented in an organized way, the activity assistant organizes a variety of activities for various institutions like camps, recreation clubs, nursing home and retreats, shelter homes, camps and so on, they help people in socializing with one other and also take charge of logistics. 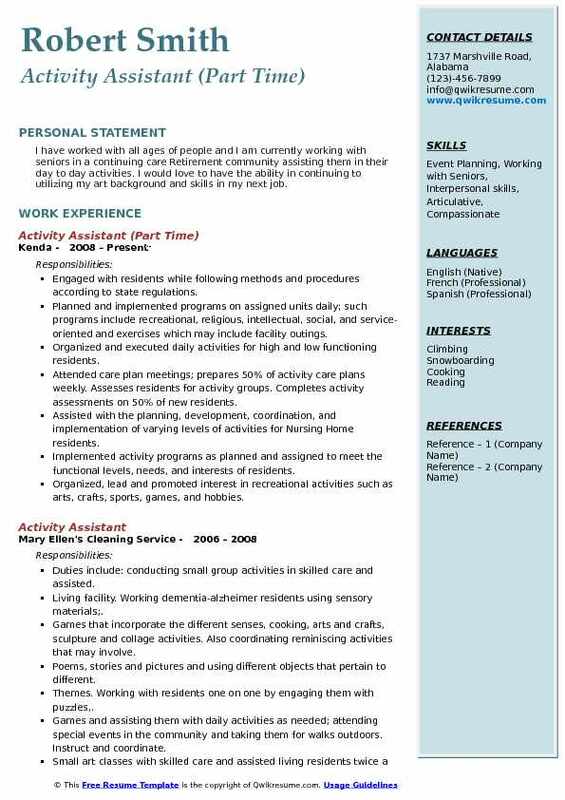 Those interested to make a career as an activity assistant should portray in the Activity assistant Resume sample their strong communicative skills, interacting ability, problem-solving power, and interpersonal skills. 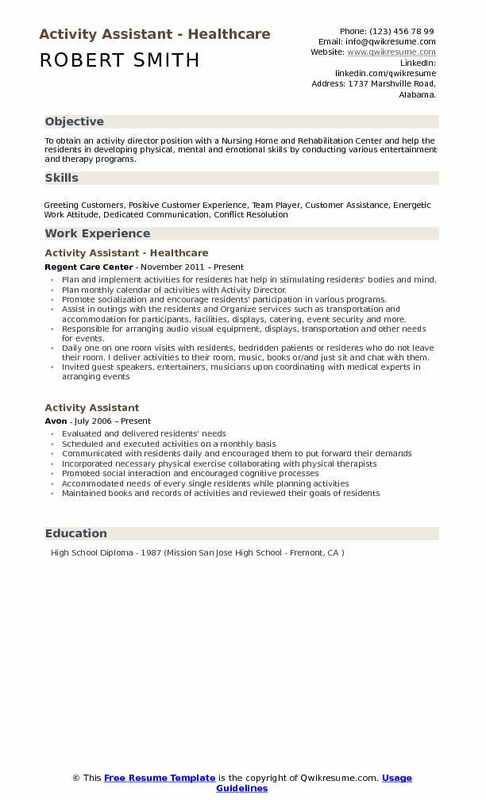 In terms of educational qualification needed for this job position, employers look out for a high school diploma with additional specialization in fields like leisure studies, marketing, hospitality management or event hosting. 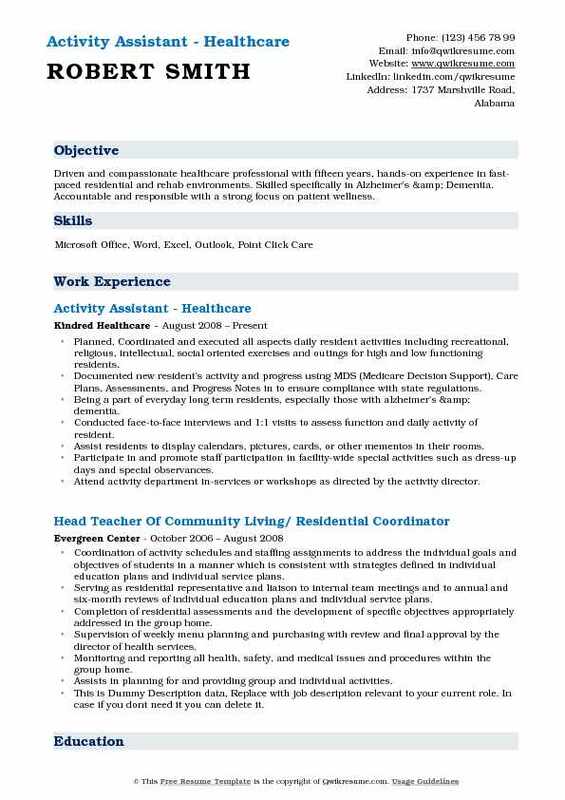 Summary : To obtain an activity director position with a Nursing Home and Rehabilitation Center and help the residents in developing physical, mental and emotional skills by conducting various entertainment and therapy programs. Plan and implement activities for residents hat help in stimulating residents' bodies and mind. Plan monthly calendar of activities with Activity Director. Promote socialization and encourage residents' participation in various programs. Assist in outings with the residents and Organize services such as transportation and accommodation for participants, facilities, displays, catering, event security and more. Responsible for arranging audio visual equipment, displays, transportation and other needs for events. Daily one on one room visits with residents, bedridden patients or residents who do not leave their room. I deliver activities to their room, music, books or/and just sit and chat with them. Summary : Experience in planning, organizing and conducting recreational and therapy programs for residents in a 5 star facility with excellent understanding of monitoring and executing skill-based programs and activities. 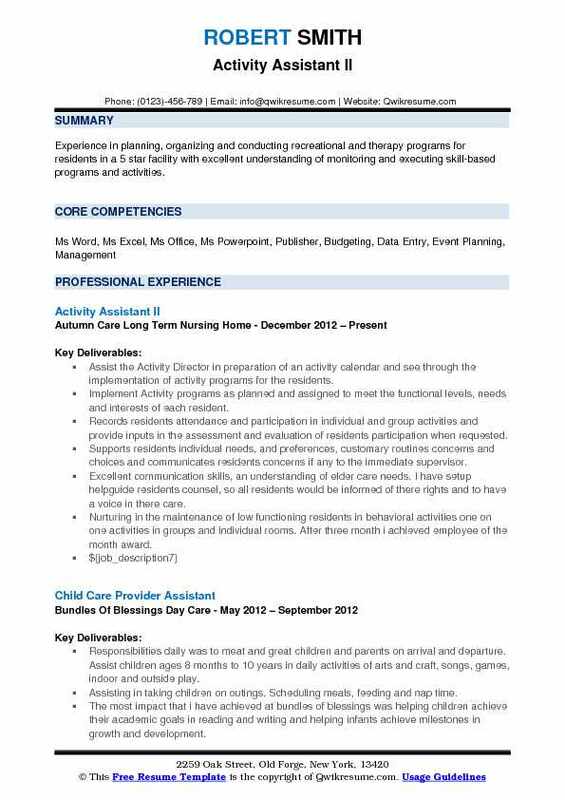 Assist the Activity Director in preparation of an activity calendar and see through the implementation of activity programs for the residents. Implement Activity programs as planned and assigned to meet the functional levels, needs and interests of each resident. Records residents attendance and participation in individual and group activities and provide inputs in the assessment and evaluation of residents participation when requested. Supports residents individual needs, and preferences, customary routines concerns and choices and communicates residents concerns if any to the immediate supervisor. Excellent communication skills, an understanding of elder care needs. I have setup helpguide residents counsel, so all residents would be informed of there rights and to have a voice in there care. Nurturing in the maintenance of low functioning residents in behavioral activities one on one activities in groups and individual rooms. After three month i achieved employee of the month award. Summary : To provide children or adults with the necessary care and education to be successful individuals. By creating an environment that is stimulating, encouraging, safe and adaptive to each persons individual needs. To offer my support interest and time with an individual to encourage them to be all they can be regardless of their cognitive ability and to offer all my assistance individually. Assist in planning and conducting the scheduled therapeutic programming of activities with creativity and flexibility. Lead stimulating programs in language arts, poetry, comedy, nature and garden groups, arts and crafts, spelling bees, current events, and reminisce discussions. Assist in trips to lincolnshire theater, the botanic gardens, pottery making, the cuneo estate christmas light show, old country buffet. Introduce and lead successful programs: piano entertainment for music and massage, word games, exercise, casino club, comedy yoga, disco club, my pet visits, wii bowling, art appreciation discussion, and you be the judge. Dependable and hard working, dedicated to the resident's enjoyment of program. Creates superior and engaging displays and posters for facility for all seasons, holidays and special events to enhance resident's orientation to time and place. 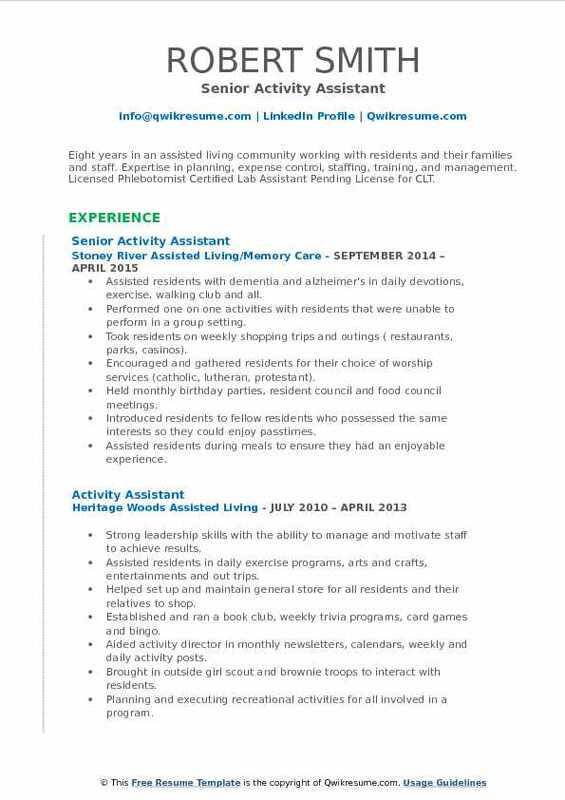 Summary : Eight years in an assisted living community working with residents and their families and staff. Expertise in planning, expense control, staffing, training, and management. Licensed Phlebotomist Certified Lab Assistant Pending License for CLT. Assisted residents with dementia and alzheimer's in daily devotions, exercise, walking club and all. Performed one on one activities with residents that were unable to perform in a group setting. Took residents on weekly shopping trips and outings ( restaurants, parks, casinos). Encouraged and gathered residents for their choice of worship services (catholic, lutheran, protestant). Held monthly birthday parties, resident council and food council meetings. Introduced residents to fellow residents who possessed the same interests so they could enjoy passtimes. Assisted residents during meals to ensure they had an enjoyable experience. Summary : I have worked with all ages of people and I am currently working with seniors in a continuing care Retirement community assisting them in their day to day activities. I would love to have the ability in continuing to utilizing my art background and skills in my next job. Engaged with residents while following methods and procedures according to state regulations. Planned and implemented programs on assigned units daily; such programs include recreational, religious, intellectual, social, and service-oriented and exercises which may include facility outings. Organized and executed daily activities for high and low functioning residents. Attended care plan meetings; prepares 50% of activity care plans weekly. Assesses residents for activity groups. Completes activity assessments on 50% of new residents. Assisted with the planning, development, coordination, and implementation of varying levels of activities for Nursing Home residents. Implemented activity programs as planned and assigned to meet the functional levels, needs, and interests of residents. Organized, lead and promoted interest in recreational activities such as arts, crafts, sports, games, and hobbies. Summary : Driven and compassionate healthcare professional with fifteen years, hands-on experience in fast-paced residential and rehab environments. Skilled specifically in Alzheimer's & Dementia. Accountable and responsible with a strong focus on patient wellness. Planned, Coordinated and executed all aspects daily resident activities including recreational, religious, intellectual, social oriented exercises and outings for high and low functioning residents. Documented new resident's activity and progress using MDS (Medicare Decision Support), Care Plans, Assessments, and Progress Notes in to ensure compliance with state regulations. Being a part of everyday long term residents, especially those with alzheimer's & dementia. Conducted face-to-face interviews and 1:1 visits to assess function and daily activity of resident. Assist residents to display calendars, pictures, cards, or other mementos in their rooms. Participate in and promote staff participation in facility-wide special activities such as dress-up days and special observances. Attend activity department in-services or workshops as directed by the activity director. 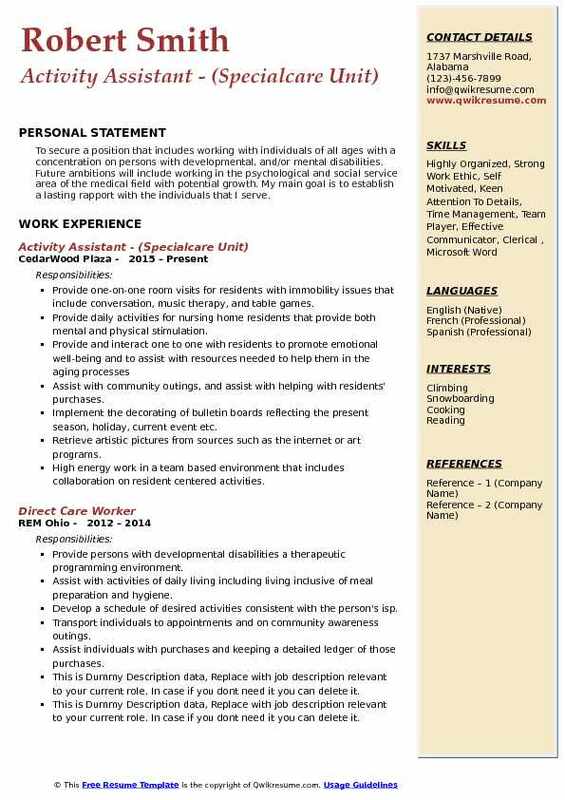 Summary : Currently seeking position in patient care profession that not only utilizes my creative abilities and clinical experience but inspires quality of life in geriatric population groups. Fulfill basic intellectual, physical, social, emotional and spiritual needs of residents by providing direct services to promote the wellness of residents. Conducts activity programs as planned to meet the functional levels, needs and interests of each resident. 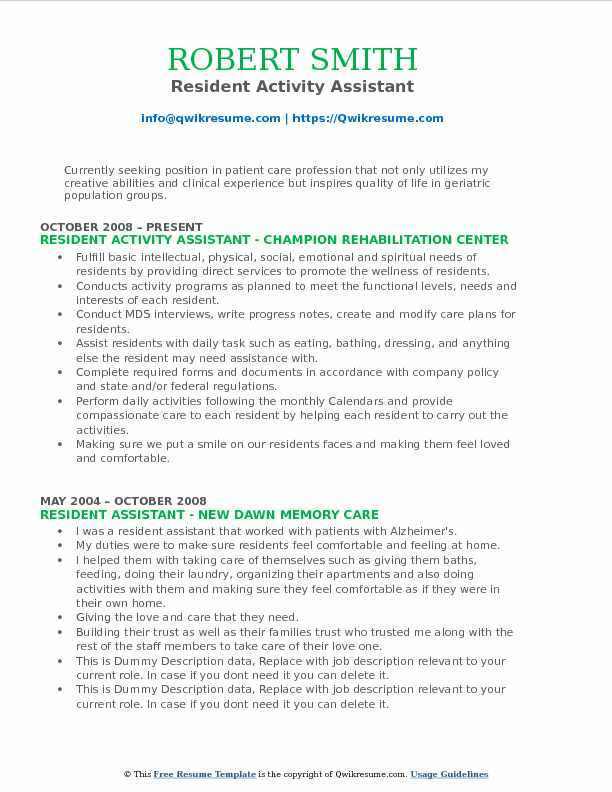 Conduct MDS interviews, write progress notes, create and modify care plans for residents. Assist residents with daily task such as eating, bathing, dressing, and anything else the resident may need assistance with. Perform daily activities following the monthly Calendars and provide compassionate care to each resident by helping each resident to carry out the activities. Making sure we put a smile on our residents faces and making them feel loved and comfortable. 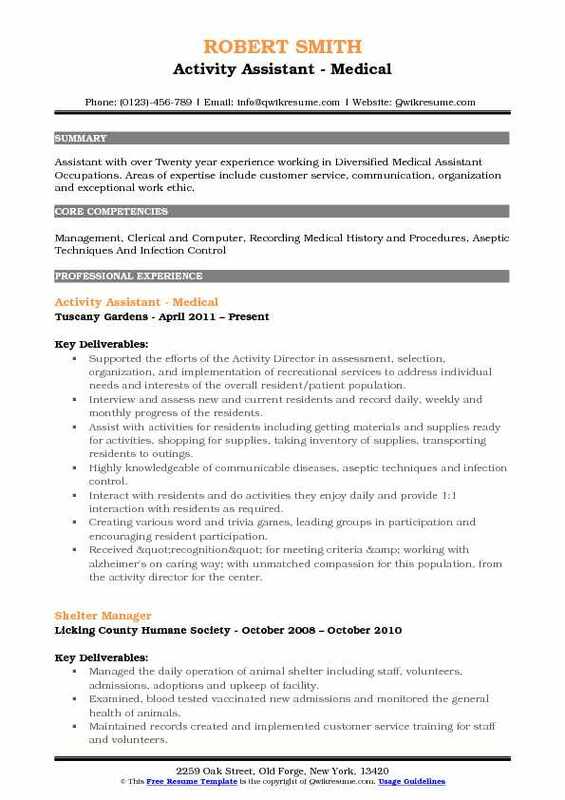 Summary : Assistant with over Twenty year experience working in Diversified Medical Assistant Occupations. Areas of expertise include customer service, communication, organization and exceptional work ethic. Supported the efforts of the Activity Director in assessment, selection, organization, and implementation of recreational services to address individual needs and interests of the overall resident/patient population. Interview and assess new and current residents and record daily, weekly and monthly progress of the residents. Assist with activities for residents including getting materials and supplies ready for activities, shopping for supplies, taking inventory of supplies, transporting residents to outings. Highly knowledgeable of communicable diseases, aseptic techniques and infection control. Interact with residents and do activities they enjoy daily and provide 1:1 interaction with residents as required. Creating various word and trivia games, leading groups in participation and encouraging resident participation. Received "recognition" for meeting criteria & working with alzheimer's on caring way; with unmatched compassion for this population, from the activity director for the center. 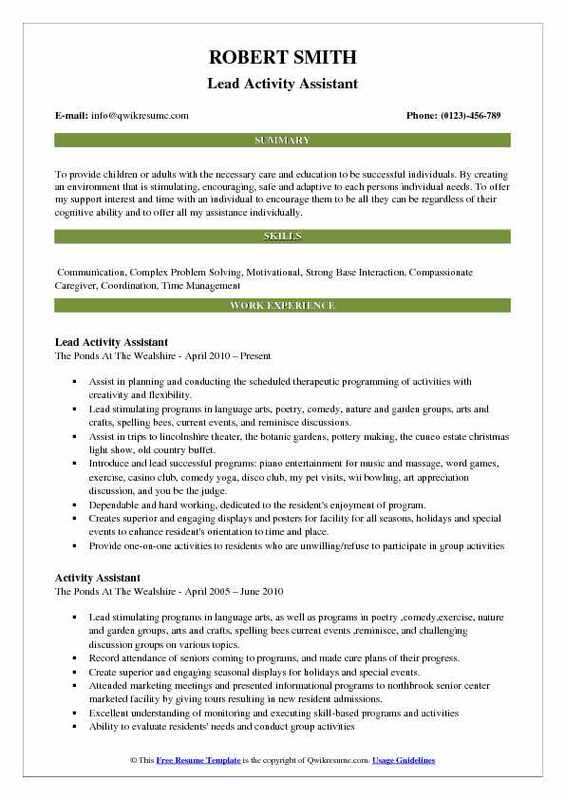 Objective : To secure a position that includes working with individuals of all ages with a concentration on persons with developmental, and/or mental disabilities. Future ambitions will include working in the psychological and social service area of the medical field with potential growth. My main goal is to establish a lasting rapport with the individuals that I serve. Provide one-on-one room visits for residents with immobility issues that include conversation, music therapy, and table games. Provide daily activities for nursing home residents that provide both mental and physical stimulation. Assist with community outings, and assist with helping with residents' purchases. Implement the decorating of bulletin boards reflecting the present season, holiday, current event etc. Retrieve artistic pictures from sources such as the internet or art programs. High energy work in a team based environment that includes collaboration on resident centered activities. 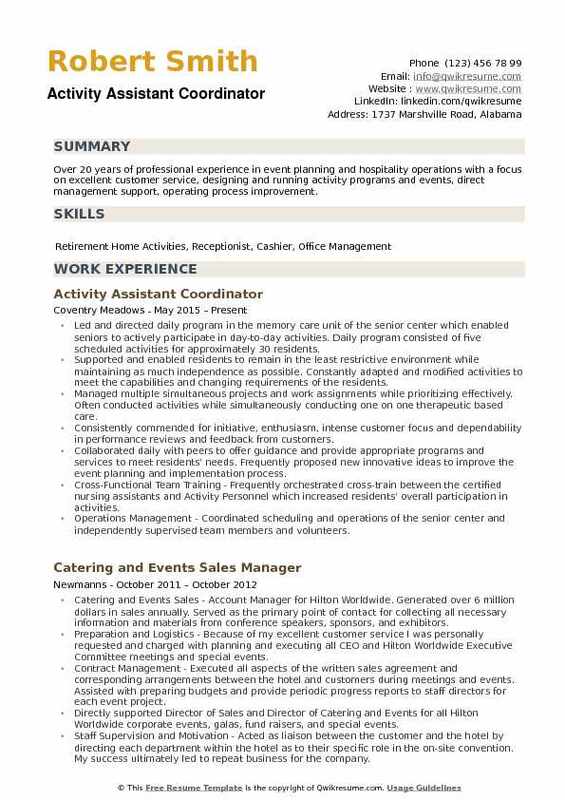 Summary : Over 20 years of professional experience in event planning and hospitality operations with a focus on excellent customer service, designing and running activity programs and events, direct management support, operating process improvement. Led and directed daily program in the memory care unit of the senior center which enabled seniors to actively participate in day-to-day activities. Daily program consisted of five scheduled activities for approximately 30 residents. Supported and enabled residents to remain in the least restrictive environment while maintaining as much independence as possible. Constantly adapted and modified activities to meet the capabilities and changing requirements of the residents. Managed multiple simultaneous projects and work assignments while prioritizing effectively. Often conducted activities while simultaneously conducting one on one therapeutic based care. Consistently commended for initiative, enthusiasm, intense customer focus and dependability in performance reviews and feedback from customers. Collaborated daily with peers to offer guidance and provide appropriate programs and services to meet residents' needs. Frequently proposed new innovative ideas to improve the event planning and implementation process. Cross-Functional Team Training - Frequently orchestrated cross-train between the certified nursing assistants and Activity Personnel which increased residents' overall participation in activities. Operations Management - Coordinated scheduling and operations of the senior center and independently supervised team members and volunteers.